Boiler Robotics is excited and ready to host the Purdue Vex U Pre-Worlds Scrimmage!!! We will be hosting the competition within our home the Lawson Computer Science Building. Purdue's Team, Boiler Robotics will be in attendance and welcomes any Vex U team who wants to compete. They will also be ready to answer any technical questions teams may have with Vex hardware and/or PROS. Transform your understanding of robotics as we look at how robots work and why they are an important part of our daily lives. Watch demonstrations and participate in activities from Indiana FIRST, an organization dedicated to growing robotics programs in the state of Indiana. This event will showcase current research and education efforts in IUB's School of Informatics and Computing through posters, live demonstrations, computer simulations and visualizations, and more. Come see what members of our community have been working on! This event is open to IU faculty, staff and students, anniversary attendees, as well as the broader Bloomington community. 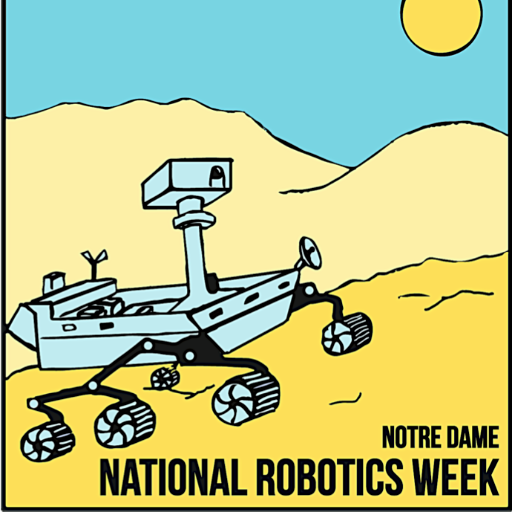 For five years the Computer Science and Engineering labs at the University of Notre Dame have worked hard to organize a National Robotics Week Event. This event brings together researchers, educators, students, and community members who all share a passion for robotics, and look forward to sharing their passion with the public! The public is encouraged to come and “play” with the robots from dancing to sorting legos, to playing football, there will be a variety of robots exhibited at this event. This interactive event is free and open to the public.